What are Hydraulic Chain Trenchers? Doing any kind of renovation in your home is a massive undertaking. You are going to need a lot of tools and tricks of the trade that will help you in performing these tasks with ease. This is why most people prefer hiring a contractor to do this kind of work. However, if you consider yourself to be an expert in this field and want to save up on some money then you can go the DIY route. This would require you to hire some machinery, though. For instance, if you are looking to make changes to your homeâ&#x20AC;&#x2122;s backyard then you will need the right tools. Among these tools is a hydraulic chain trencher. What are They Used For? Hydraulic chain trenchers are hydraulic attachments that are hooked up to other machines and used for the purpose of digging up trenches. These trenches can be used for a number of different purposes. In the case of a DIY backyard remodelling, you would need to dig up trenches to build waterways. Moreover, you would also need them for relaying the cables and wiring for different utilities. A hydraulic chain trencher can easily dig up trenches that you want and complete the task within a few hours. As is evident from their name, these machines are powered by hydraulic fluid. How to Use Them? The hydraulic chain trenchers are not too difficult to operate. However, you still need to read their safety guidelines before using them for any kind of renovation job. If you are dry hiring this hydraulic attachment, you should make sure that you are provided with a manual which lists all the steps that you need to follow in order to operate it safely. Following the manual will ensure that you wonâ&#x20AC;&#x2122;t have any issue in using this machine for digging up a trench. 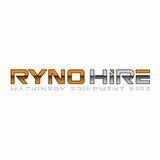 Ryno Hire is a provider of heavy machines and equipment used for remodelling and construction for hire. If you want to dry hire any hydraulic attachments then we can help you out. 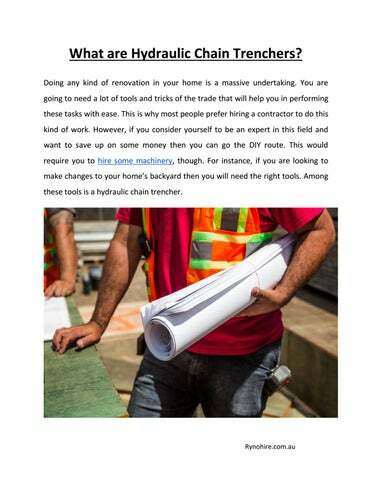 What are Hydraulic Chain Trenchers?